Jeannie Motherwell whose work appears in San Francisco Peace and Hope. You can see “Perfect Storm” in chapter 1 of the current issue. Kit Kennedy: You come from a veritable art family (father, Robert Motherwell; stepmother, Helen Frankenthaler). Your dad said, “You have talent and the bug.” Your parents pinned your drawings on the refrigerator and framed your art. When did you know you were an artist? Jeannie Motherwell: My interest initially developed in high school where I had a wonderful art teacher. But I took my art more seriously when I went to Bard College and majored in painting. My father and I had just returned from a trip to Europe. We had numerous discussions about art and I was very excited about studying in an art department where all the professors were internationally known artists exhibiting in the now “happening” Soho. When I began painting at Bard, I found myself writing letters to (and calling) my father describing the feelings I had while painting or contemplating various challenges in my work. The feeling of elation I received from painting was like continually falling in love. 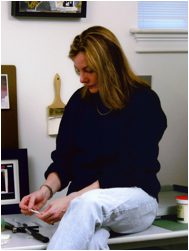 KK: Do you still get that feeling of falling in love when you paint? JM: Of course! One ages, but yes, it still holds true for me. When I finish a painting and I learn something I did not know before, I fall in love with the picture. JM: In Provincetown, the beach, light and the moment-by-moment way the sea changes. I no longer have a Provincetown studio so I have had to re-create my inspiration. These days, poetry and collage, the celestial bodies and what is happening in outer space inspire me. My new work seems to be incorporating inspirations from both my recollections of the view from my Provincetown studio and the celestial series of paintings I recently completed. I love how they are connecting earth and sky. KK: Collage and poetry — That’s of interest to the SF Peace and Hope poetry community. Please elaborate. JM: The poetry in my collages has mostly been taken from poet friends of mine. Many attended college with me, majored in poetry and still write today. I think there are one or two earlier collages that have Rilke — when my daughter, who also attended Bard, was experiencing her first love. KK: How do you keep yourself motivated; your art fresh? How do discipline and deadlines play out in your life? JM: It is always more helpful to have deadlines as motivation, but when that is not the case, I know showing up in my studio is half the battle. Even if I don’t feel like going there some evening, I meander there anyway; eventually things begin to happen, I see something that needs to be altered, or I begin a new painting, and then I get into the rhythm of my painting. If I don’t show up, obviously nothing will happen. JM: When I see something that totally surprises me and it hits me in the gut. It’s like an “aha moment” or it could be described as a lucky accident. There are no certainties in painting, but you have to keep yourself open to new ideas, while pushing your limits. The only thing I want to control is when I know something about the picture is wrong…so I make a correction. Rarely do I throw out a painting. I am usually able to revive it from drastic mistakes. But I am on a constant journey and when I am lucky, I discover amazing things about the dynamics of any given work. KK: Please describe one of your lucky accidents. JM: The other night I was working on a large painting on the floor. It was too wet to lean it against a wall so I could see how it was working. But I had a feeling it would be a good picture. Once it was dry, I leaned it against the wall and thought it was a pretty good beginning. Then I turned it upside down and it hit me in an instant that this is the way the painting is going to go, from now on, until it is finished. KK: In an interview you mentioned that black is your favorite color. Is that still true? Has your palette changed? JM: Black has always been a favorite color of mine because I try to use it in so many ways — mostly as a color vs. a mood or darkness or depth. In recent years my palette has been very much influenced by the sea and the sky and the earth. But black is a “go to” color for me and I often resort to it when I am unsure of what color to use instead. KK: When do you know your painting is finished? JM: I usually have a direction of where I’m going. But sometimes the unexpected happens. Every once in a while, I feel a complete lack of control, and there’s a spark that really excites me — that’s my fodder. I know I need to relinquish control so I don’t lose the innocence of the picture. KK: When you’re not art-making what engages you? JM: I work full time at Boston University for a graduate program in arts administration. I work with two other artists, one visual, the other, a musician. Our goal is to help students understand how to “make the world safe for art — not making art safe for the world.” The artist shouldn’t feel creatively restrained. In theory, there are no limits to art. KK: How has your 9-5 influenced your art? JM: I don’t think I could work a 9-5 job if it weren’t involved in the arts in some way. I feel our program is giving our students experience and tools they need to become good arts managers in both the visual and performing arts sectors. That said, it is certainly a challenge to transition from my day job to entering my studio at night. The discipline of showing up each night in my studio gives me fodder for why I do what I do during the day. KK: When you go to your studio, how do you ready yourself for the night’s work? JM: Before I paint, I need to get really loose and not think too much. Basically, I blast rock music. When I realize it’s late and I’m probably disturbing our neighbors, I shut down for the night. KK: When someone who doesn’t know you looks at your art, what do they know about you? JM: I guess it would depend on how much they know about painting in general. But depending on which body of work they are looking at, they might think I am serious and pondering, or drenched in exploration of space, color and energy. It’s a curious question, because I’ve never really thought about it. I just want people to get engaged when they look at my work. I’m sometimes told that it takes a while to take them in. There is more than meets the eye, I hope. I would like to think they are contemplative in some way. I want my paintings and their surfaces to look easy and fresh but ultimately they are more complicated than that. KK: What advice do you have for emerging artists? JM: The art world is an ever changing and fast paced enterprise. Study hard, paint a lot, and never give up the joy and awe of exploration. Do it for yourself, but also give back to the world in some way. KK: In a 1976 interview you talked about Bobby, a dark-haired fisherman who perished on the Patricia-Marie boat too full of scallops making its trip back to Provincetown. Thirty years later, you commented that when painting abstracts the Patricia-Marie tragedy was “a pivotal memory for me.” Please comment. JM: When I began painting in college, I learned a lot from my professors. Clearly, I had also gathered a wealth of knowledge from Helen and my father. But it wasn’t until a couple of years post graduation, that I decided to spend two winters in Provincetown, Massachusetts, where I had a studio on the bay. I had summered every year there, so it was a natural haven for me to find out what I was made of. The first winter I was there, a tragic accident occurred with one of the local fishing boats. I was friendly with several of its crew, all of whom perished. The morning before the (Patricia Marie) boat sank, I was riding my bike through town on my way to do the bike trails – one of my morning rituals. When passing by the local bar, a friend of mine, Bobby Zawaluk called out to me to come join him for a drink. (Fishermen, I quickly learned, are on their own timetable). Needless to say, I had a coke, instead. We were chatting a bit when he mentioned he would be going back out to sea early the next morning. He tried to buy me another coke, as if to say he wanted to talk more with someone on land before heading back to sea; he pulled out a huge wad of hundred dollar bills. When I declined, he said, “gee, I can’t even give my money away!” That was the last time I saw him. They didn’t recover his body for several days, but the first thing of his they did recover was his wallet. I found that so ironic. As the town began its mourning, I was driven to make a stack of abstract paintings about this community tragedy. They were my “elegies” to the Patricia Marie and the town of Provincetown. I had become so close to the locals during this first winter that I wanted to share my compassion for what had happened. I realized, as I painted furiously, that I had made my first ‘body of work’ that had my own signature — not Dad’s and not Helen’s. That was a pivotal moment that enabled me to return to NYC to resume a career in painting. KK: Please speak to us about the recent tragedies with the Boston Marathon and how that affects you as a Bostonian and artist. JM: I felt sick while it was going on. I was born and raised in NYC and felt the pain when the Twin Towers went down. I remember living in Soho when they were built and thinking how ugly they were, but when they went down, I took it personally. Whenever an unexplained tragedy of this nature occurs, like the Boston Marathon bombings, I suppose one’s natural response is that of shock and horror, then anger, then grief. Never, in my life have I experienced an entire city lockdown. It gave me real pause when I realized how palpable the nature of terror is. Our program was directly affected by the marathon bombings, as one of our alums was thrown out of the bleachers at the finish line and is now recovering from a broken back and two broken wrists. She says she is one of the lucky ones. She has at least a year of physical therapy ahead of her, and without mobility in her hands, she can’t do photography (She was once a photographer for the mayor’s office). In Boston, people came together as quickly as they did in Provincetown and in New York City, so many years ago. I think it is a testament about good vs. evil — evil can do a lot of damaging things, but it cannot crush the spirit. Hope and peace and our spirit are what I like to believe we as human beings are about. I grew up in a different time. I didn’t live under the fear of terrorism. It’s challenging now to raise children to be innocent and yet keep them aware of the world and to be safe. I hope and pray for our world, and that it doesn’t take a tragedy or disaster to make people come together. KK: If you were given one wish, what would it be? JM: I’m community-oriented. I’d like my family (daughter, stepdaughter, stepson, grandchildren) to know that life is a gift. It’s essential to give back in some way. It might be in a small way, but it is necessary to give back, nevertheless. KK: What’s your next project? JM: I was recently picked up by the Quester Gallery in Greenwich, CT, where I plan to exhibit in the fall. I’m excited because the gallery is incorporating dance, performance, poetry, and painting in its future endeavors. I have gone back to making fairly large paintings again; perhaps another homage to something bigger than me.